Lima is the gateway to Peru. Founded in 1535 by the Spanish Conquistador Pizarro, it was originally called the 'City of Kings' and became the former colonial capital of the region. Today Lima is a bustling and diverse capital city and is home to a third of all the population of Peru. The mix of the old with the new creates an interesting mix of cultures, architecture and people. The people are warm, friendly and very proud of their city which houses one of the best collections of post and pre Columbian art and artefacts in its range of museums. The city provides a worthy start to your Peru vacation. Just a few hours south of Lima is a vast red desert in which hundreds of enormous drawings lay stretching across the sands. These larger-than-life etchings, known as the Nazca Lines, are as perplexing as they are beautiful, and visitors to the small town of Nazca will have plenty of time to ponder their significance as they soak in some pool-side sunshine during the stay in Paracas, a tiny coastal town situated next to one of the most abundant stretches of ocean in the world. Located in a peaceful bay where visitors can marvel at the wealth of marine wildlife to be found both in the Paracas National Reserve and on the nearby Ballestas Islands. 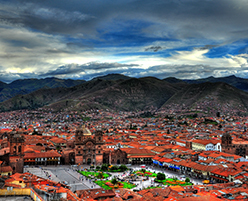 Cuzco, the "Home of Gods" as the Incas referred to it, served as a hub for the empire. Cusco, a city considered the most impressive pre-conquest city in the Americas, will dazzle you with its mix of Spanish colonial and Inca architecture as you start your tour of the ´Heart of the Inca´. Once the centre of the Inca Empire that spanned present day Peru, Ecuador, Chile, Argentina, Bolivia and southern Colombia, this city still is an outdoor museum reflecting hundreds of years of history. From here enter into the depths of the Sacred Valley of the Incas. Carved into the epic landscape of the Andes Mountains this is a vast and fertile valley. Underneath brilliant blue skies that characterize this verdant region one can still observe age-old villages, millenary traditions and impressive relics of the once mighty Inca Empire. As you Journey through the Sacred Valley you will have the opportunity to climb the ruins of the military outpost of Ollantaytambo and wander through the famous market of Pisac. Once used solely by official Inca messengers and nobility, the vast network of roads known as the Inca Trail is now full of exhilarating experiences for the adventurous traveller. This famous section of the trail meanders through a rich and varied landscape of green valleys, staggeringly high mountain passes and wildlife-rich forests before leading trekkers to the grand citadel of Machu Picchu. Of course, Peru is most famous for Machu Picchu, the magnificent ruins that are also known as the "Lost City of the Incas." The very sight of Machu Picchu is every bit as magical as you have heard, a stone complex nestled high in the mountains and often bathed in misty, gauzy clouds that make it seem even more mysterious. 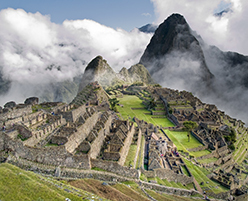 Machu Picchu is a breath-taking site which leaves the beholder mystified, humbled, and awed. At a dramatically high altitude of 12,397, Puno claims fame to the highest navigable lake in the world, the gorgeous Lake Titicaca with its ancient legends. This region of Peru is famous for its varied and colorful folk traditions, as it has some of the most dazzling and richest folk ceremonies to be witnessed in this part of the continent. From great lakes to the lush jungle lowlands and mist shrouded forest of the Peruvian Amazon, a vast territory teeming with enough wildlife and flora to make a lasting impression on any nature-loving traveller. The simply stunning variety of biodiversity in Manu and Iquitos is matched only by the diversity of the region's age-old tribes and customs. Peru offers a lifetime of destinations, with hidden secrets awaiting discovery. The weather varies according to area. On the coast winter lasts from June to September. During this period the mountainous areas are often sunny during the day but cold at night. This is high tourist season and the best time to visit most regions. From London to Lima is approximately 14 hours. Lan Peru and Iberia flights operate via Madrid.